The 23rd episode of THE FIRE AND WATER PODCAST is now available for your listening pleasure! THE FIRE AND WATER PODCAST is the official podcast of FIRESTORM FAN and THE AQUAMAN SHRINE. You can find the 23rd episode of THE FIRE AND WATER PODCAST on iTunes. While you’re there, please drop us a review on the iTunes page. Every comment helps! Alternatively, you may download the podcast by right-clicking here, choosing “Save Target/Link As”, and selecting a location on your computer to save the file (37 MB). 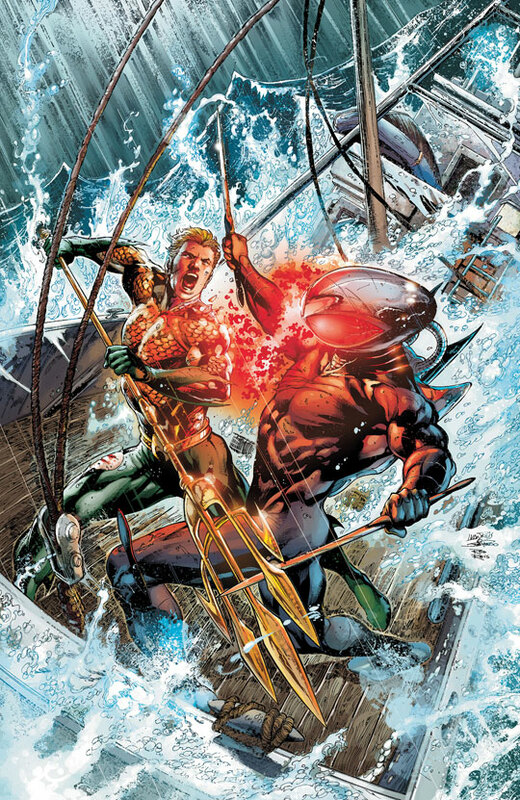 Check out the gorgeous virgin covers (meaning without the logos) to the The Fury of Firestorm and Aquaman issues covered on this podcast! Note Ronnie appears in the original art, but not on the final cover. Posted in: Comic books, Ethan Van Sciver, Firehawk - The New 52, Firestorm #09: New 52 v1 (Firestorm Protocols), Firestorm comic vol. IV, Geoff Johns, Jason Rusch, Joe Harris, Mikhail Arkadin/Pozhar, Podcast, Ronnie Raymond, Yildiray Cinar. Hi Shag. This is not really a comment on the podcast— I haven’t had the pleasure yet— but rather on the new solicit for #13. I want to put in a request that you treat it in all honestly. I want to know what you really think about it, and I think a lot of followers of this site would too. In other words, unless you’re actually excited about yet another writer and artist change, don’t try to shine a lot of sunshine on this. I know it’s sort of your job to drum up excitement for the book, but after so many changes, and to lose the gorgeous artwork of Yildiray Cinar, I don’t know how you can still do it. Maybe I’m wrong about this; maybe you’re the biggest Dan Jurgens fan in the world. But I just don’t see what anyone can say about it other than “let’s give it a chance and hope for the best.” I wish I could say that I think Jurgens is the guy who can turn it all around for the nuclear man, but I don’t. Never mind, I saw your tweets. Okay, I’ll give him a chance. It’s still frustrating, though, to adjust so much to different creative teams. Martin has some very good points, as usual. It’s really difficult to spin a 4th version of the creative team in 1 year into something positive. I don’t know if Joe Harris only signed on just to be a caretaker for a few issues until they found someone to really take over for Van Sciver or not. If not, then Harris may be getting a little bit of a raw deal here through no fault of his own. That being said, he seems to have other big projects on the side, so hopefully things go well with those for him. I like Jurgens, so I’m glad to see him taking over, I will definitely miss Cinar’s art, his stuff is gorgeous! The reason this whole change makes me optimistic is that it seems that DC really wants a Firestorm book to succeed. At the time of the new 52 launch, Simone and Van Sciver were pretty big names to be attached to it (depsite how it may have turned out), so DC clearly wanted a little bit of “Star power” behind the Firestorm name. Now from the #13 solicit and the zero issue, it seems someone at DC editorial is listening to the fans who want a more traditional Firestorm back, it seems like we are getting that. Let’s not fool ourselves, with the sales numbers, this book wasn’t long for this world. The fact that DC didn’t take the easy way out and pull the plug on it but instead seem to be really trying to get the title back on track is hope to me for at least a little optimism. That is a good point, Lee. It has to be said that DC has given this book more than a fair chance. What would be nice is if there was some recognition that the past twelve issues were an experiment, and if the book could be given at least another twelve issues to find its footing with the return to Jason and Ronnie as a more traditional approach to Firestorm. My only problem with Jurgens really is just that his participation on a book seems to be a harbinger of cancellation. I think it’s unfortunate for him too that his career might begin to carry that stigmatization. I know it’s hard to turn down any work at all, but if I were him I’d start thinking about how many imminent-cancellation titles I’d agree to. 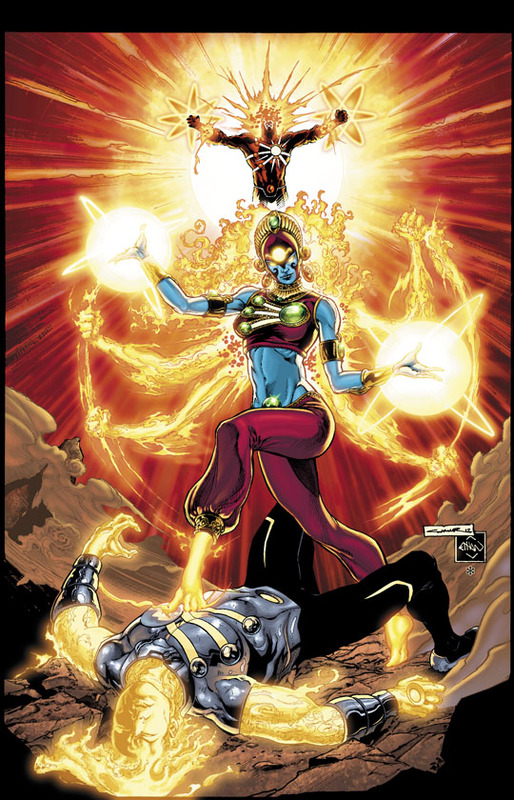 Thinking post-cancellation (I know, just trying to be practical), I wouldn’t mind a book with Firestorm, Blue Beetle and Booster Gold as a sort of male version of Brids of Prey. Four volatile youngish guys making up three superheroes. Could be interesting. Maybe with Jurgens on the title (BG having been his creation), this is where they’re going? I seriously doubt Joe Harris came on as a caretaker. This book started out being sold on the names of Gail Simone and Ethan Van Sciver, but by year’s end was down to a couple of guys not really familiar to most readers. I think EVS tried to build Harris up on his way out, but DC threw the whole creative team under the bus. New and edgy wasn’t selling, so now we’re going retro with Dan Jurgens. In the three pages I read, there wasn’t a single negative comment regarding the change. Instead, a lot of guys planning to or having already dropped the book are excited about Jurgens, and many proclaimed that they would return. I take that as a very good sign. …I hastened to add of course that I don’t care about Dan Jurgens, and my interest in the series evaporated instantaneously, but I think he’s the better course for the book commercially. I don’t see that Jurgens has had such bad luck with books lately. He launched the still running Green Arrow, took a tour on the good selling Superman, and helped sustain Booster Gold well past where anyone would have guessed. Have not heard the episode yet but I have to say I was very surprised to see Dan Jurgens name attached to Firestorm in the solicits. I generally like Dan Jurgens, but my opinion dates to the mid 1990s Superman stuff, so I haven’t read his stuff lately. This looks like a “throwback” sort of Firestorm, and I think a title like that is a good match for Dan Jurgens, but the proof, as they say, is in the pudding pop. Can’t wait to listen to the episode! I’m not sure that “throwback” and “retro” are such bad things at this point. This series so far has raised a certain philosophical issue— the “Ship of Theseus” paradox, which is a question of something called mereological essentialism— how many times can you replace the parts on an object and have it remain the same object? I mean, we still have Jason and Ronnie, but they don’t merge into Firestorm. They’re Firestorms themselves, each in their own right. Instead, they merge into something called Fury. And there’s a whole bunch of other Firestorms too. What resemblance does this bear to Gerry Conway’s vision of “Two men– physicist Martin Stein and high school student Ronnie Raymond— caught in a bizarre nuclear accident! Now they are able to merge and possess The Fury of Firestorm the Nuclear Man!”…? I had the same problem with the Elemental run too. It’s not to say that I didn’t enjoy aspects of Firestorm v. 2 issues 85-100 (which I happen to know off the top of my head). But it felt like *some other book* being superimposed on the property Firestorm. In other words, somebody else’s pet idea that they pitched and couldn’t get into print under its own steam, so it instead piggybacked on an existing property, namely Firestorm. Let me put it this way. I could imagine this entire series so far *without* any reference to Firestorm. Call it “The Protocols.” America has a protocol. India has a protocol. England has a protocol. All of it based on *string theory* and the *God Particle*, not based on nuclear energy as we understand it and consume it (e.g., the stuff of power plants and reactors). Every bit of it could be done without any reference to Firestorm the Nuclear Man. And that’s a problem. But you take two guys who merge and trade off being in control, and who have transmutation powers based on nuclear energy, and who essentially like each other but who sometimes have a little bit of friction with each other? That’s Firestorm, and no one else. That’s honestly what I’d like to see at this point. Hey guys! Thanks for all the feedback on the big change. Now I hope some of you listen to the FIRE & WATER episode. I’m gonna do a post for Tuesday on the big creative change. My short answer is (cause I’m short for time), I’m pretty shocked. It looked like with issue #0 they were giving Harris & Cinar a chance with a more “classic” Firestorm. Obviously I’m a huge fan of Harris and Cinar, so I’m really sad to seem them go. Not only are they amazingly talented, they are also super-nice and have been really supportive of FIRESTORM FAN. On the other hand, I’m a huge Dan Jurgens fan. I love his JLI, Booster Gold, Superman, Teen Titans, and the list goes on. So I’m sad to see some of my favorite creators leave the book, but I’m also excited to welcome another of my favorite creators. Whatever happens with sales, it certainly looks like we’ve got some exciting stories coming in the next few months! Listened to the podcast at last! Thanks to Rob for explaining what an embellisher does. I had always wondered whenever I saw that credit. I thought Shag had an excellent point about the series needing to establish what “normal” is. Perfect summary. A status quo has been missing and so far, because the book is about the journey, that’s been fine, but at the ten-issue mark, indeed, it does seem to be time for us to figure out what “normal” is for Jason and Ronnie. I also thought it was an interesting point that Shag made about whether or not Mikhail is actually Asha Kahn himself. I’ve also been wondering… is he even Mikhail Arkadin, or is this someone who assumed Mikhail’s identity? The only reason I ask is because this Mikhail’s personality is so far removed from the previous continuity. Ronnie’s personality is not that far removed from the previous continuity and neither is Jason’s (though I would say Jason’s is closer than Ronnie’s). But this Mikhail is so far away from Mr. Nice Guy from the previous continuity that it does make me wonder a little. I think it is safe to say that we were all a bit blindsided by the news yesterday about the creative team change. In my excitement about that, I realize I didn’t post any thoughts about the podcast. Again, it’s another well done episode. I say it a lot, but the chemistry between Shag and Rob is really great. It makes the show a real joy to listen to. On to Firestorm 10. Shag made a good point when he said that Firestorm doesn’t seem to have many story arcs as we know them, it’s just one long journey. I can appreciate that and if I tell my 11 year old we are going to Disneyland, he would be ecstatic. If I coop him up in the Chevy for 10 days to drive him there, he’s going to lose a lot of his excitement during the journey. That’s kind of how I feel with this book. There’s been a lot of build-up, a lot of “Wait until you see this!”, but very little pay off. Maybe I am wrong, but when you have a “B” list hero like Firestorm, and you are taking him down a new, radically different path than what fans are used to, I think you have to provide some answers a lot faster than usual, or you’re going to lose people. With a proven entity like Batman or Green Lantern, you can string people along for 10 issues and the book still sells like hotcakes, I think for Firestorm it’s a different story. Where is Killer Frost, or Tanya or Cliff? Why did Jason have a protocol in the first place? What happened to Stein? Who controls Fury? What does Zither really want? These are all questions from the start of the series and I’m not sure I could answer any of them, and that’s a little disappointing. Speaking of questions, before the book even launched there was a piece of promotional art with Ronnie and his red suit on one side and Jason in yellow on the other, with a center frame of a hand reaching out from the ground, did we ever find out who that hand belongs to? I don’t want to sound like I don’t enjoy the Firestorm book, because I do. But the pretty constant shuffling of the creative team has clearly taken its toll on the story, and now that we know that it’s basically a whole new start with issue 0, I’m not sure how invested I am in what happens in the next 2 issues. I am hoping that Dan Jurgens can stick around for a nice, long run. Regarding Alan Moore’s Swamp Thing: I just read Watchmen in 2009. I just read COIE earlier this year. I just read Dark Knight earlier this year. And I have never read Swamp Thing. So there. Oy! I would love to see a New 52 version of Rodan! Especially since IDW has the Godzilla license. “Boom! All of a sudden you had Conan!” Sorry Rob but that just cracked me up. Like a magical spell which summons Conan or something. I had heard of “Call Me Maybe” but not actually listened to it before this episode. I went to Wikipedia and listened to a sample. Uhh, yeah, I’m with you on this one Shag, this is pure garbage and I was happier not knowing what this nonsense was. Really enjoyed the show guys! Keep up the good work! Im a big fan of Dan Jurgens, have been for years… BUT I seriously will miss Yildary’s art. Im not dogging Jurgens art I honestly love it, but I feel this book needs a “younger” approach! Like Kenneth Rocafort, Patrick Gleason, Steve Mcniven, Eddy Barrows, YILDARY CINAR etc… And when I say younger I dont mean in age but rather in art styles! Jurgens is really great with his character moments, so im really looking forward to that! I’d pay $3 to read a Firestorm/Conduit throwdown. And I am not being sarcastic. In Blackest Night, I was so excited when Kenny Braverman’s remains were shown in the JLA satellite but I don’t think we ever got Black Lantern Conduit, did we? Maybe Ronnie has a Kenny Braverman of his own, or the New 52 Kenny goes to Ronnie and Jason’s school (and still hates Clark Kent somehow). Im stoked that Jurgens is on Firestorm, but how KOOL would it be if Tom Grummet were to come on board as artist!?! (Kenny Braverman has me reminiscing of my favourite DC penciller ever, next to Jose Luis Garcia Lopez). Thanks for all the feedback! We’ll be sure to read as much as we can on the next episode! Did someone say Tom Grummett? You made me pause. He’s one of my all time favorite artists. Seeing Grummett draw Firestorm in POWER COMPANY was a pure joy. Thanks again, you Match-heads and Water-logs! Firestorm was in Power Company? @Keith – Check out this link for more on Firestorm’s time with the Power Company. Keith, I think in an early issue of Blackest Night, when we see the remains of the various villains stored on the JLA Satellite, one of the coffins is labelled “Kenny Braverman.” I remember wondering what good a Black Lantern Kenny Braverman would be, unless he somehow had a zombie version of his armor as well. Thanks Shagg for that link. I must be getting old in my young age, I cant believe that I missed that post about the Power Co. and the great Tom Grummet! That series came out when I was studying for my degree, and so I didnt have a whole lot of cash to spare… Also im not the biggest Buisek fan!